Flood Forensics: Why Colorado's Floods Were So Destructive Nearly a year's worth of rain was dumped on parts of the state in four days this fall. The downpour from the heavens created a slurry on the mountainsides that scrubbed away soil, trees, boulders and buildings. Scientists say the flooding may have been a once-in-a-thousand-years event. 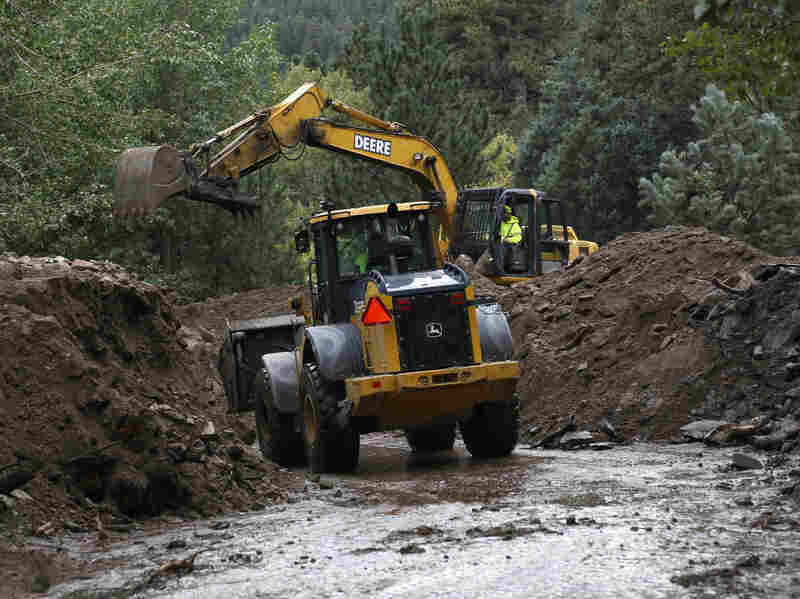 Parts of Colorado are still drying out after floods hit the state last month. Eight people died, and damage from the worst flooding in decades is in the hundreds of millions of dollars. Scientists are now venturing into the hardest-hit areas to do a sort of "flood forensics" to understand why the floods were so bad. Geologist Jonathan Godt takes Peak Highway in northern Colorado up into the Rockies. The road there winds past ravines and streams where water is still rushing. 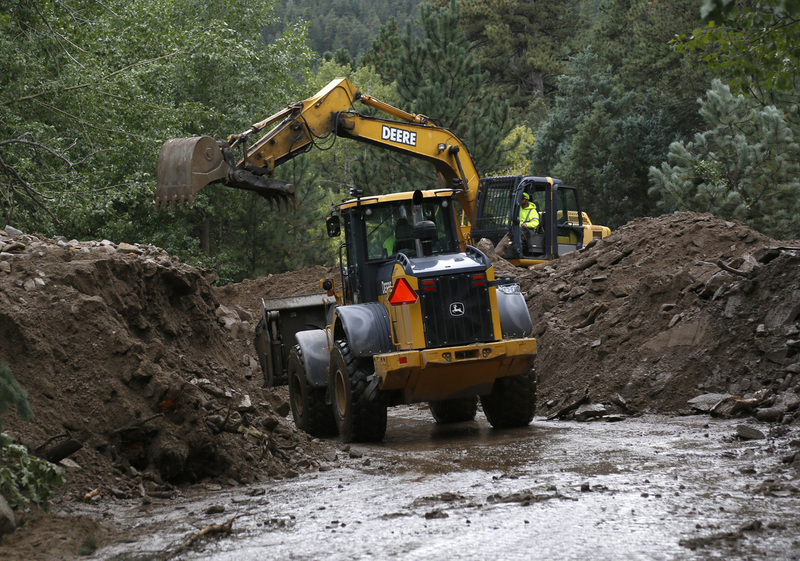 Heavy equipment works to clear a Jamestown road after a landslide covered it with more than 20 feet of mud. Front-end loaders are scooping up boulders that were tossed by the flooding stream onto the pavement, and workers with acetylene torches cut through guardrails that have been twisted like pretzels. Godt pulls his SUV to a stop. A huge tongue of muddy debris has cut a new path through the trees on the slope and down the mountainside. It looks like a ski run, except it's mud. "This is sort of on the scale you'd expect [from] one of the volcanoes in the Pacific Northwest," he says. Godt, who studies landslides for the U.S. Geological Survey, says water keeps the soil and rock stable on these steep slopes — up to a certain point. It's like adding water to a sandcastle, he says. "There's this sweet spot — if it's too wet, it's like a slurry. It's unstable." If the soil becomes too wet, mountainsides collapse — and flow downhill. That's what happened across Colorado's northern Rockies. The floods started with a wall of moist air from the Gulf of Mexico that got trapped up against the mountains, dumping almost a year's worth of rain in four days. As the overflow coursed through mountain ravines and canyons, it was like running a fire hydrant through a garden hose. But it wasn't just water. Streams became rivers of trees, boulders — and an avalanche of concrete. Farther along the highway, we find thousands of uprooted trees, dumped in a jumble by a flooded stream. Above the jumble, the stream bed has been scoured out. "Right now, the stream channel looks like it's been eroded down to the bedrock in places," Godt says. It may take years for streams like this one to support fish again. The mountain village of Jamestown is still digging out from under tons of rock and mud. A man died here in a mudslide. We stop beside James Creek, which runs through town, and scramble down the stream bank. Godt looks around and reconstructs what happened. A flow of debris raced down this stream, he says. 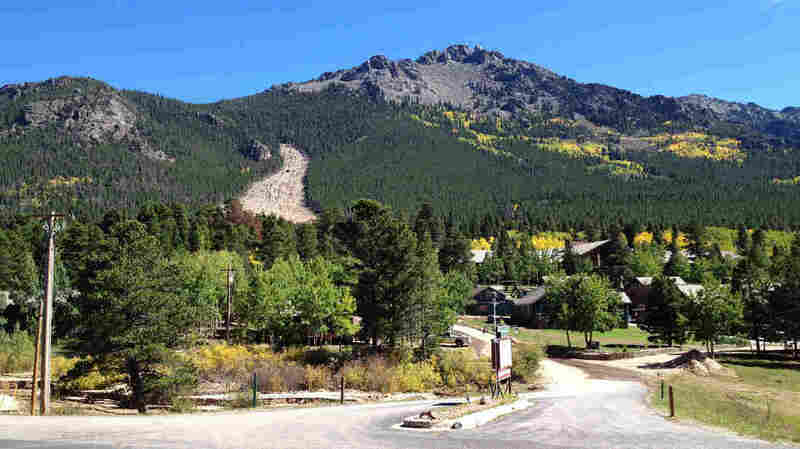 "A debris flow has a coarse, bouldery front at the snout of it. And behind that is going to be a fluidized mixture of material, sand and stuff behind that, with a watery tail behind that." Still more streams of debris descended from the surrounding hillsides. The town was hit from all sides. "It's not like a water flood," Godt explains. "It carries a lot more momentum; it can do a lot more destruction." In this case, the flood of liquid and debris plummeted down the mountain, then shot across the road, across the stream, and rushed up the slope on the other side. "You can see that mud plaster, which is indicative of a debris flow passage — it's up 15 feet in those trees," Godt says. For more than four days, water and mud and rock plunged 2,000 feet from the peaks into foothill towns like Boulder and Longmont. In fact, the pulse of floodwater traveled 400 miles along rivers, all the way to Nebraska. Everywhere it went, the flow left a muddy trail that worries scientists. "There were bridges that were completely overtopped and left with mud," says Geoff Plumlee, a geologist at the U.S. Geological Survey and a dust expert. "Now trucks are driving over it, creating these massive dust clouds." 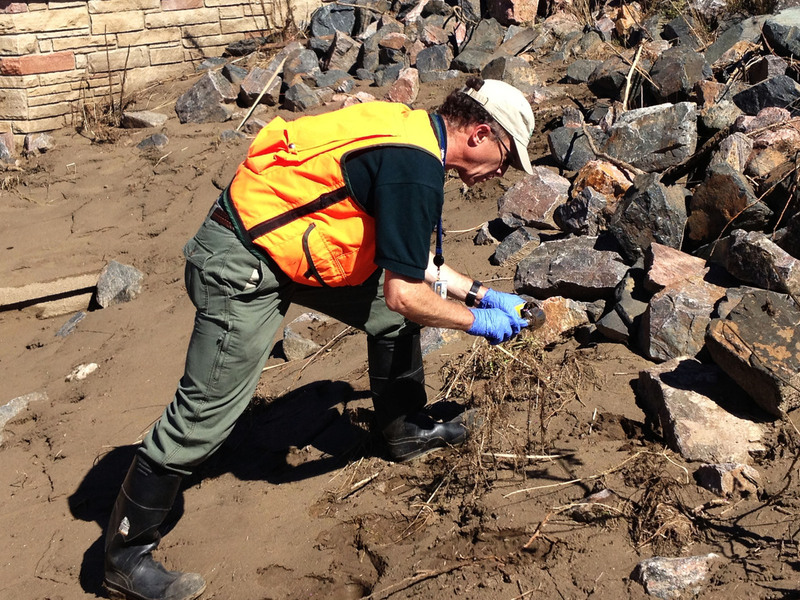 USGS scientist Geoff Plumlee samples mud and debris along Left Hand Creek in Longmont, Colo., for toxic metals that may have washed down from mines in the mountains. Plumlee worries the dust clouds could be toxic. He helped identify toxic materials in the debris from the fallen World Trade Center towers in New York City. 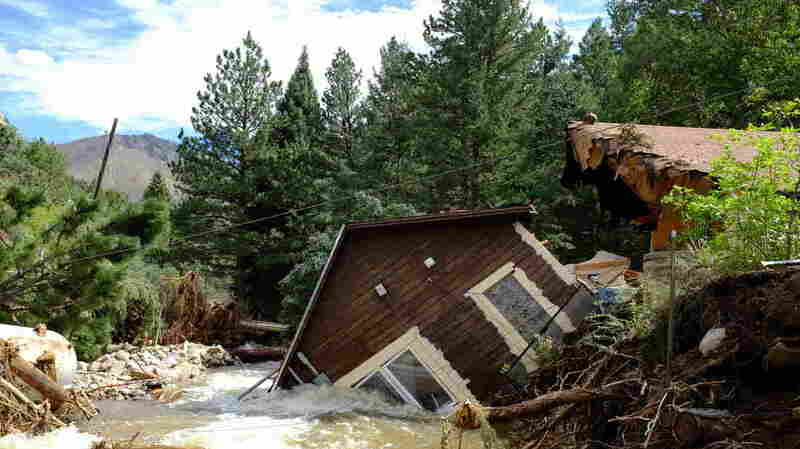 In Colorado, he says, the floodwaters swept through mountain mining operations and picked up a lot of junk. "Lead and uranium are probably the two elements that might be of potential concern," he says. The floods have had environmental effects, but one recent change in the environment here may also have made the flooding worse — huge wildfires. Wildfires burn away vegetation that holds soil together; when it rains hard after that, you get big, fast mudflows. Ten years ago, the hills above Jamestown burned. Klaus Wolter, a climate scientist at the University of Colorado who lives five miles away, saw it happen. "So this is kind of scary to contemplate, that 10 years after a fire, you can still have these effects," Wolter says. Scientists are now looking to see if there's a link between Colorado's recent wildfires and the heaviest flooding. Wolter says he and other Coloradans need to acknowledge this fire/flood dynamic. "We've had an increase in the number of people that live somewhere in this burn zone," he says. And that exposes them not just to fire, but to the floods that follow as well.